Looking for active adult living that in a historic part of Virginia - that is also hip? Look no further than Fredericksburg! Very close to all of the highlights below is Fredericksburg's newest maintenance-free community - The Villas at Harrison Crossing. 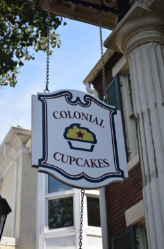 There are great shops, historic sites, and wonderful scenery all over the Fredericksburg, Virginia area. A recent article in the Washington Post highlights all of the wonderful attractions to the city. Are you ready to move? Read the article below for retail highlights, arts and antique shopping, restaurant information, and more. Fredericksburg might want to start hyping itself as Brooklyn on the Rappahannock. After spending time in this small historic city 50 miles south of Washington, I can honestly say Fredericksburg, on a much smaller scale, is undergoing a renaissance not unlike that of New York City’s coolest borough. There’s a vibrant art scene, a focus on DIY, artisanal food, farmers markets and a host of new shops that sell wine racks made of old pallets, vintage Polaroid cameras and 200-year-old wood beams. There are also plenty of places to get a tattoo. Entrepreneurial hipsters are moving into old-town Fredericksburg’s 18th- and 19th- century buildings and opening upcycled-furniture stores, reclaimed-wood shops and farm-to-table eateries. Although a decade ago the vibe in Fredericksburg was more Colonial Williamsburg than the Williamsburg section of Brooklyn, today you can buy custom-designed skateboards and hand-sewn yoga mat straps alongside antique tavern tables and Civil War memorabilia. On Caroline Street, the main drag of the historic district, there are still venerable antiques shops. And a stop at Whittingham (1021 Caroline St.), a classy, well-stocked tableware and kitchen emporium, will have you starting your Christmas shopping in August. At Hooked (1009 Princess Anne St.) you might pick up a vintage camera or a vintage Coach bag. Or you could just pet the store mascot, English bulldog Sgt. Pepper, as you admire the shop’s floors made with layers of decoupaged comic book pages topped with resin. “There is momentum going on here,” says David Fraser, 32, who opened Fraser Wood Elements (820 Caroline St.) in May to sell old flooring, furniture and accessories. Many stores have retail in the front and studio space in the back, where owners paint or make pottery and also teach classes. “We lived in Brooklyn for seven years, and it taught us how to do a lot in a little space,” says Scarlett Pons, 41, a potter who owns Ponshop Studio with her husband, artist Gabriel Pons, 39. The Ponses, both architects, opened their business in 2010 to click into the art community. “We couldn’t do this in New York; it’s not affordable,” says Scarlett Pons, president of the Fredericksburg Main Street Initiative, a nonprofit group working to create a livelier downtown. Pons says the city has been through ups and downs in the past few years, but the energy is high right now. ‘This is one of few historic downtowns left that still has so many buildings intact as well as a lot of old trees. It’s a wonderful place to walk around,” she says. Emporio (703 Caroline St.) Two savvy military wives, Carmelita Scholes and Pam VanCuren, opened this shop two years ago. Their philosophy: Your home should have something old, something new and something handcrafted. Stock includes giant carved wooden angel wings ($235 a pair), aprons made of cabbage rose prints ($16) and a vintage lamp with a shade hand-painted with scenes of Fredericksburg ($150). They stock the Annie Sloan Chalk Paint line, and workshops are held once or twice a week in a lovely studio on the lower level of the 1820 brick building. Fraser Wood Elements (820 Caroline St.) After talking with David Fraser and taking in the scent of old wood in his shop, you’ll be ready to invest in a 200-year-old chestnut beam. You can buy an old heart-of-pine floor with decades of history reflected in it, or Fraser will custom-design a table for you made of salvaged or new wood. The store opened in May, and he is adding new pieces such as handmade wood watches (made of recycled skateboards) from Oregon ($245), wood-and-tin lanterns ($45 and up) and coat racks made of reclaimed wine barrel staves ($70). When Pigs Fly (1011 Caroline St.) Artist Janese Simunek and husband Melvin Brown specialize in repurposed, recycled and repainted furniture and home furnishings. A vintage suitcase made into a pet bed ($30) and Mason jars turned into outdoor torches ($10) are examples. The Time Out chairs are handpainted kids’ chairs with a timer attached to the back ($65). Take a Refunk Your Junk class to make over your own piece, and check out the shop’s Swine and Cheese reception schedule. Whittingham (1021 Caroline St.) and the Kitchen at Whittingham (1019 Caroline St.) The first thing you need to know about Bob Whittingham is that he was once display director for Cartier in New York. Twenty years ago, he decided to go into business for himself in Fredericksburg. A man of exquisite taste, he fills his adjoining shops with all the things you need to lead a good life: china, glassware, trays, hard-to-find gadgets, coffeemaking supplies, cookware, stylish furniture, gourmet foods. Fun finds include hot pink, purple or turquoise metal colanders ($22) and Epicurean cutting boards shaped like the state of Virginia ($26). Whittingham is very much in the tradition of Georgetown’s late, great Little Caledonia store. At the Kitchen at Whittingham, local chefs offer cooking classes in back. LibertyTown Arts Workshop (916 Liberty St.) This place reminded me of Alexandria’s Torpedo Factory, on a small scale. Artists work, teach and sell their pieces in a rambling building. You’ll find pottery, knitting, weaving, glass and blacksmithing in the mix. Ponshop Studio and Gallery (712 Caroline St.) The works of many diverse artists and artisans are displayed here: ceramics, candles, painted bowls, trivets, cutting boards and salad tongs among them. You’ll find yoga mat straps ($17), soy candles ($10) and ceramic cupcake stands ($24). Gardeners will be drawn to Scarlett Pons’s charming $4 ceramic garden tags for sage, turnips, chard, lavender and more. Beck’s Antiques & Books (708 Caroline St.) Bill and Susan Beck have sold antiques in this stately 1831 building since 1987. They also live above the store, following in the tradition of many shopkeepers of yore. They specialize in 18th- and 19th-century English and American pieces, especially those with a Southern heritage. They also have a large section of Virginia history and Civil War books. It’s the dreaded Interstate 95, like it or not — endless traffic, roadwork and all. Bring snacks. One good thing: I found gas prices in Fredericksburg significantly lower than in Washington, so fill up your tank before you leave town. Want to arrive in a relaxed state? Take Amtrak or VRE from Washington directly to Fredericksburg’s historic center; most shops (and nice B&Bs) are in walking distance. Carl’s Frozen Custard (2200 Princess Anne St.) has been in business for more than 50 years. The stand retains its retro look, and the low price for a cone (I paid $1.84) seems vintage, too. Cash only. Foode (1006 C/D Caroline St.) has brought food buzz to Fredericksburg. Go here, sit in the casual European-style courtyard and have the Fredericksburger (with bacon aioli and on a brioche) and freshly squeezed ginger-basil lemonade. TIPS For more information, go to www.visitfred.com. The Fredericksburg Visitor Center (706 Caroline St.) has a lot of information on places to see and local happenings such as the First Friday gallery openings.